In the end some find the way home – through the Wardrobe, the Looking Glass, or perhaps through the Lichgate. 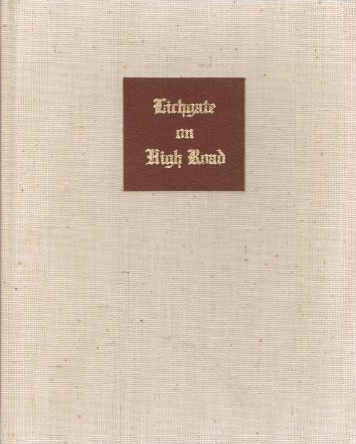 The last book written by Laura was self-published in 1981 and was called, "Lichgate on High Road". Since so much of Laura's correspondence was lost during the vandalism of the cottage just before her death, this book remains as one of the best sources we have about what Laura read, what she thought, and what her legacy was to become. Ultimately it is the goal of this page to delve into each short chapter of her book and provide some insight into the things lurking behind her words. Everything Laura wrote, sometimes even a single word she chose, are laden with stories and meanings that stretch into a distance I am only barely able to glimpse. Like reading a novel by James Joyce, I sometimes fear that I am missing a message or meaning that she wanted all of us to comprehend. After more than 3 years of research I still feel that there is so much to learn from her scattered writings. It is important to rescue her voice from the dustbin of history, her's is a unique story, her's a unique mind and one we shouldn't lightly forget. In the end we are hoping to publish an annotated version of Laura's book with all of our collected research incorporated into it. By peeking over Laura's shoulder as she sits at her desk and writes, I am hoping to breath a new life into her masterwork and give the you, the reader, fresh insight into the magic of the Lichgate. Chapter I - "O triumphant and transporting thought,..."
Chapter II - "As my house passed through is several metamorphoses..."
Chapter III - "Like lichgates, old houses allow one to recapture the past." Chapter IV - "Having moved my cabin log by log in the Blue Ridge,..."
Chapter V - "Upon reflection, I thought of my mountain friend,..."
Chapter VI - "While the chimney rose in height..."
Chapter VII - "When I first took up my abode in the woods,..."
Chapter VIII - "Two years passed..."
Chapter IX - "After the rigors of two winters,..."
Chapter X - "The front door swung open..."
Chapter XI - "Near the house stands a dog house..."
Chapter XII - "As the oak gradually asserted it dominance..."
Chapter XIII - "In a different sense, I could cultivate the birds..."
Chapter XIV - "The Druids believed a holly tree near the house..."